Step into magic wonderland… With this in mind I’m thinking about a big fairy tale castle and it’s snowing. The snow leaves the most beautiful white carpet that you will ever see… And the best part is that it isn’t cold in my magic wonderland… With this in mind I will review the new limited edition from essence. 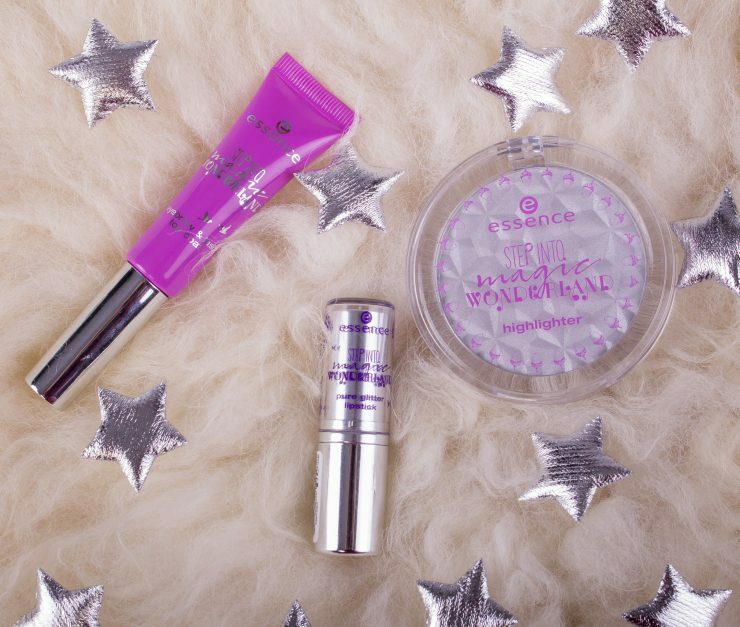 So let’s step into magic wonderland and let’s surprise you with essence and there magic makeup products! This highlighter got directly all my attention. It looked so special and pretty in the packing. I couldn’t try it out in the drugstore. So after taking pictures I immediately used this one! And on my skin is it even more pretty than in the packing! Who doesn’t want bright pink eyebrows or lashes? For me that was a dream that I had when I was a child. 😉 But when I saw this weird and special eyebrow top coat I needed it! Are you curious how I look with pink eyebrows? To be honest I find the packing from this lipstick a bit cheap looking… Also the idea from this glitter lipstick looks a bit like the once from Rihanna here brand; fenty but then from the galaxy collection. Oh, and soon I will review these lipsticks. 😉 But is this one a good or bad look a like? The pigmentation from this lipstick is for sure ok. It’s not wow but after a few layers you get the result you can see below. So I think that this product is more a top coat to make your lipstick more special. But you also can perfectly were it like this! It’s a special dark purple cold color with much and I mean much glitter in. The glitters are silver, dark pink and purple. But they feel a bit chunky. Do you remember when you where young and playing with child makeup. This lipstick feels a bit like those lipsticks… Ok, it looks special and all. But personally I don’t like the weird feeling from this lipstick on my lips. But maybe it’s indeed better as a top coat to make your lipstick special. So I will give it a second change! This collection brings for sure the wonderland feeling! The lipstick is not my favorite… But I love the highlighter, I’m going to use this everyday now! And the pink eyebrow top coat is not a product that I’m going to use right now. But when the festival season is back I know where I can find it! You can find this “step into magic wonderland” collection till the end of this month (December) in the drugstore. Vind het een erg mooie lijn heb er ook een aantal producten van. Leuk om jou blog te lezen. Ik heb deze producten ook al in de winkel zien liggen maar heb ze niet gekocht. Toch vind ik het wenkbrauw product erg leuk! Ja he dat wenkbrauw product is enorm speciaal maar wel super leuk! Wauw dat wenkbrauw product staat je ontzettend mooi! Ik ben onder de indruk en die highlighter is ook mooi, subtiel. Vind vooral de highlighter er erg mooi uit zien! De rest vind ik een beetje heftig, misschien wel heel leuk als je al roze haar hebt en je wenkies ook roze wilt maken. Ik snap zeker dat je de rest wat heftig vind hoor! Zelf vind ik het wel leuk voor een gek feestje of festival! Mooie kleurtjes paars! Dat staat je goed hoor. Die wenkbrauwen maken het helemaal af he! Ik weet niet zo goed of het iets is, wat ik zou durven dragen! Hehe thanks! En dat snap ik zeker en vast roze wenkbrauwen kom je echt bijna niet tegen! Hehe, ik snap je zeker en vast hoor!